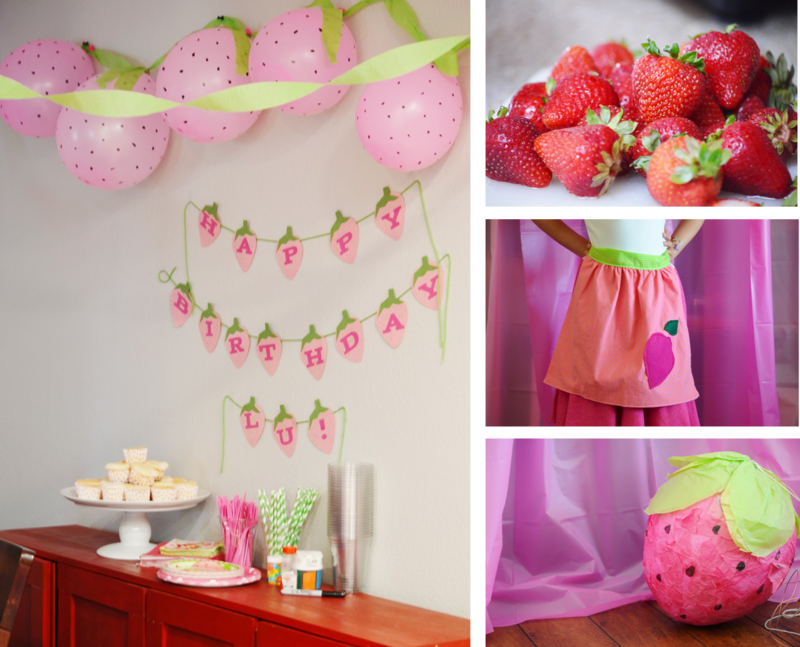 Snugglebug University: Lu's Strawberry Shortcake Birthday Bash! Lu's Strawberry Shortcake Birthday Bash! Each year I share with you some pictures of Lu's birthday party (do you remember last year's tea party? ), mainly because Lu's birthday dreams are always so involved! It seriously wouldn't surprise me if this kid is a party planner someday. Unfortunately for her, Mom and Dad are very thrifty, so most of her ideas are met with questions like, "Well, how do you think you could make that?" By now she's gotten pretty used to our comments, so her ideas come with elaborate "how to" plans that leave me thinking "AGHH!!! I've created this monster!" Ok, not completely, but you get what I mean. Last year Ellie asked for one thing on her 3rd birthday--homemade dolls--when Lu was her age she asked for a princess dress up area, Ariel's boat, Belle's Market, and dress up clothes for about every Disney princess. This kid LOVES parties, and has this habit of turning small parties into something much bigger than I originally intended. It's really ok though, because we've shared so many great times with these party projects, and I hope she looks back on these projects fondly as she grows up. The projects have been great summer boredom busters! This year Lu wanted a Strawberry Shortcake party with just a few friends. 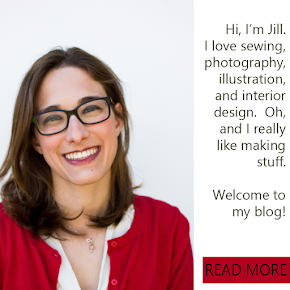 She wanted the activities to be sewing and "baking." 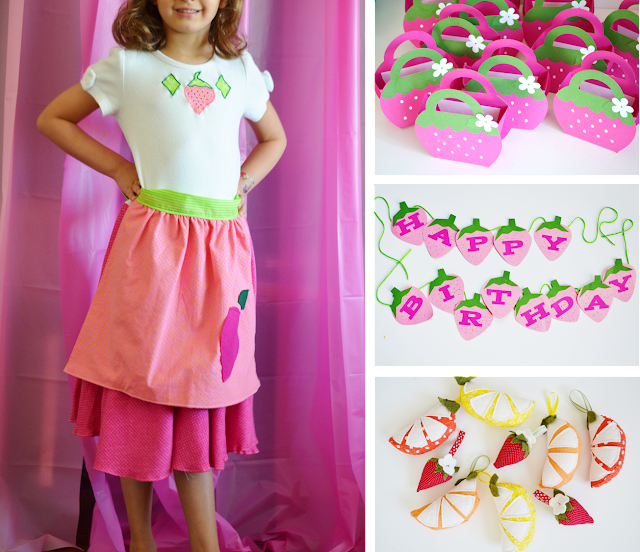 Every kid got an apron (with a strawberry that needed its' seeds embroidered on) and a sewing kit (the strawberry baskets below using my silhouette cameo) filled with a citrus pincushion or strawberry pincushion, embroidery floss, and an embroidery hoop. I made her a strawberry shortcake dress, and we also made a strawberry pinata which we filled with assorted fruit candies. Once the girls made their aprons, it was time for them to put together strawberry shortcakes for dessert. The kids got to cut up their own strawberries, and go crazy with sprinkles and whipped cream. 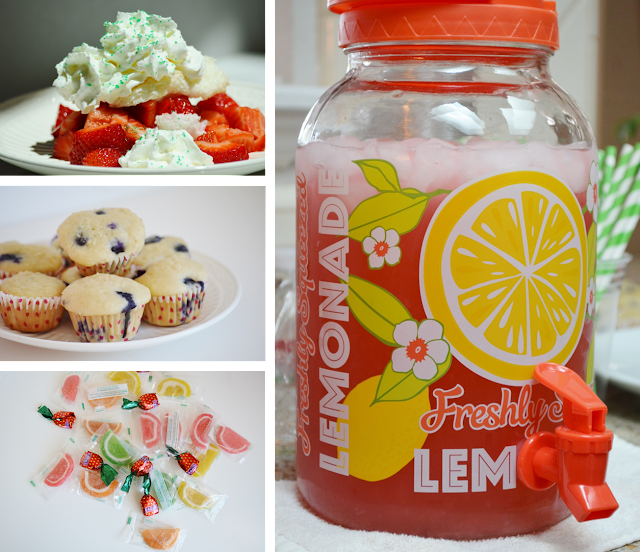 There was also raspberry lemonade and blueberry muffins to snack on. I'm thinking that I'll write up a quick post on the aprons sometime soon, but until then I'm going to go take a little bit of a rest. This party planning stuff is exhausting! I hope you all have a great week! Are you preparing for the start of school again? I'm sad to see summer come to an end! Hey, this Strawberry Shortcake Birthday Bash looks adorable. All the party details are fantastic. I am so glad to have such great party inspirations from your post. Thanks for sharing it here. You know I just booked some beautiful NYC venues for my niece’s birthday party! Wat I can say its awesome! !